Within approximately 200 miles of Detroit, including Ann Arbor, Flint, Grand Rapids, Lansing, Chicago, Columbus OH, Pittsburg, Cincinnati, Cleveland, Toronto ON, Indianapolis, South Bend, and Buffalo—I’ll be attending the US Social Forum from June 22 – 26. Maybe you know of some church, mosque, synagogue, political organization, library, senior center, community center, educational institution or other venue that might be interested in hosting one of my slide shows or print exhibits about Palestine/Israel. Or perhaps you know of someone or some organization that might like to organize presentations. Thanks for your help in spreading the images. 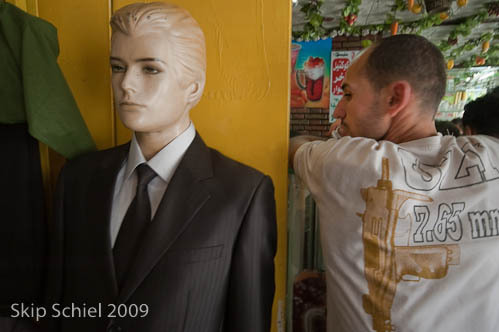 Skip Schiel has been documenting the Palestinian and Israeli reality through photographs and journal postings since 2003 – work with a better feel for the detailed texture of life in Gaza and the West Bank than any appearing in US media. Schiel spends time where most journalists dare not tread, amidst ordinary Palestinians, sharing in the dangers and frustrations of their lives. 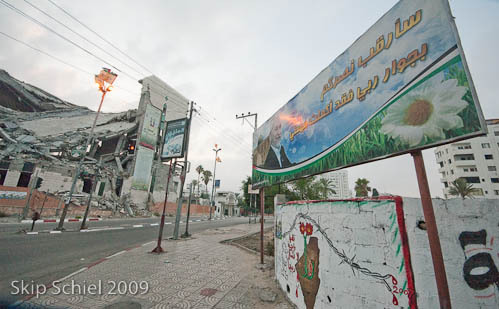 Skip Schiel, a frequent visitor to Gaza, was there in January 2008 and the summer of 2009, before and after the devastation of Operation Cast Lead, the Israeli assault on Gaza in December 2008-January 2009. While there, he was witness to the effects of the Israeli siege on Gaza as well as the aftermath of Operation Cast Lead. In Gaza, Schiel worked with the American Friends Service Committee youth program teaching and photographing, also at Al Aqsa University where he led a photographic workshop. The theme of this show is hope and hopelessness. How do residents of Gaza survive psychologically? A slide show about traveling from one of the headwaters of the Jordan, the Banias River flowing from Mt Hermon in the Galilee, to where the much-abused river disappears before Jericho. With an examination of the Sea of Galilee, especially the region of the major share of Christ’s ministry, and the kibbutzim, Israeli settlements originally intended to reclaim land and define the contours of the forthcoming Israeli nation. Israel-Palestine has scant water resources, but now with the current strife water is a dramatic mirror of power relationships. Through an examination of water in various settings—small Palestinian villages & the Gaza strip—along with large cities shared by Israeli Jews & Arabs—Haifa & Jerusalem—Schiel portrays a very difficult to visualize topic. Updated with new photos from summer 2010. Bethlehem is rapidly becoming Imprisoned Bethlehem, surrounded on all sides by an 8-meter (23 foot) high concrete wall, with checkpoint access restricted. Thus, Christians (the population shrinking from some 30% 40 years ago to 2%) and Muslims within Palestine can rarely leave or enter Bethlehem. Nearby Israeli settlements confiscate Palestinian lands while the local economy, heavily reliant on tourism, languishes under ghetto-like restrictions. Schiel explored this situation from November through Christmas 2008 as well as during the summer of 2009 while he lived in the Aida refugee camp. Updated with new photos from summer 2010. What do Quakers, the Religious Society of Friends, have to do with Israel-Palestine? By following some of the activities in the Ramallah Friends School & the American Friends Service Committee’s work in Gaza & the West Bank (& with references to its efforts in Israel), Schiel shows how this numerically small but often effective group has made a difference in this land of troubles. A work in progress, an examination, based on the brilliant analysis of Jeff Halper, of the mechanisms Israel uses to maintain the occupation: checkpoints, separation or annexation wall/fence, permit system, road blocks, Israeli-only roads, military court system, closed military zones, and closures and incursions. Another work in progress: Haifa—A little known story is that of the Arabs in Israel. Second class citizens with rights surpassing those of their sisters & brothers in the West Bank & Gaza, yet an overwhelming force besieges them.